is a constant k (kappa) the same for all circles. the same for all circles; in fact the same constant k.
p = 3.14159 26535 89793 23846 26433 83279 50288 41971 69399 37510 (58...) = 4k. 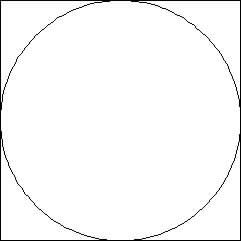 In fact p (pi) is the ratio of the area of a circle to that of a square on a radius, or it is the ratio of the circumference to a diameter, neither of which are comparisons of like properties of circle and square. A convincing case can also be made for the replacement of p by t = 2p, as in The Tau Manifesto by Michael Hartl.